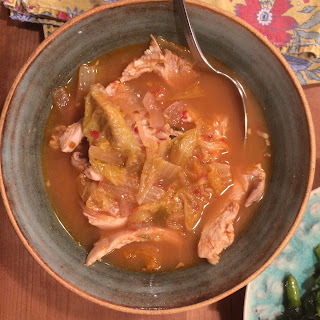 I had pulled the pack of boneless skinless chicken thighs out of the freezer earlier in the day and was staring into the fridge looking for inspiration when I eyed the jar of kimchi in the back corner…that was it…Korean chicken soup! And so easy too. I sautéed a chopped onion in a large soup pot until translucent before adding an entire 16oz. jar of kimchi and about 8 cups of chicken stock (preferably the concentrated versus boxed variety). Once it came to a boil I added the six chicken thighs and turned the heat down to a simmer. When the thighs were cooked through, about ten to twelve minutes, I removed them from the pot and set aside while the soup continued to simmer. Then when the thighs were cool enough to handle I chopped them up, returned them to the pot, and added salt and Sriracha to taste.